Sony has upped the ante in the outdoor camera game with the announcement of the $500, 18-megapixel Cybershot DSC-TX200V waterproof point-and-shoot. 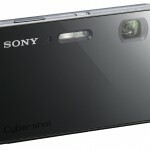 I believe that’s $100 more than any previous waterproof point-and-shoot camera and Sony says the new 18-megapixel CMOS sensor is the “highest-resolution currently offered in the ‘point and shoot’ market.” The TX200V also has an interesting new “glass design.” In the product shots provided by Sony, it looks like instead of metal or plastic, the whole front of the camera is covered with a single piece of glass. 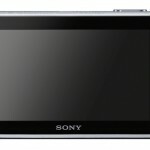 Camera control is via an extra-wide, 3.3-inch OLED touchscreen display. And of course, the TX200V also has full HD video (1920×1080/60i) along with Sony’s “Optical Steady Shot Active Mode,” to … wait for it … keep things smooth while you’re on the move. I’m going to have to trademark that! 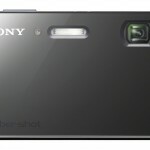 The new Sony Cybershot TX200V isn’t fully ruggedized like most waterproof point-and-shoot cameras. 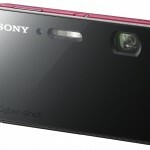 It’s waterproof to about 15 feet deep (5 meters), dustproof and it’s freezeproof – but it’s not shockproof like Sony’s previous top-of-the-line outdoor point-and-shoot, the TX10. But as long as you aren’t in the habit of dropping or smashing cameras then the TX200V looks very, very good. Last year, Sony’s TX10 was my top pick in our Outdoor Waterproof Camera Guide. Aside from the shockproofing, the TX200V has inherited pretty much everything I liked about the TX10 and then turned it up a notch. In general, I’m not a huge fan of touchscreen displays. 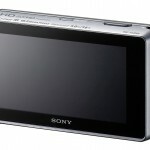 But I’ve enjoyed using Sony touchscreen cameras. I loved the touchscreen on the TX5 when I reviewed it (Sony Cybershot TX5 Pro Review).Unlike smart phones, Sony’s touchscreen camera displays can be operated with gloves on – excellent for a mountain biker like me. I also really like OLED displays (Organic Light Emitting Diode). They’re brighter, snappier and have more saturated color – they’re just a pleasure to look at and make a camera more enjoyable to use. I’m always suspicious of really high-resolution compact cameras. 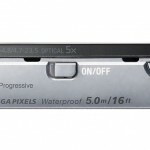 The general rule is the more pixels you cram onto a sensor, the more you compromise image quality. So naturally, we’ve got to be a little concerned about Sony’s claim that the TX200V’s new 18-megapixel CMOS sensor is the highest-resolution currently available in a point-and-shoot camera. On the other hand, camera companies get better at controlling noise every year and Sony says, the new “’Exmor R’ CMOS sensor and an improved BIONZ™ image processor… together boost low light performance.” Reading between the lines, I believe the new “Extra High Sensitivity” feature is Sony’s answer to Canon’s “HS System” compact cameras. The new processing is also supposed to make the TX200V’s auto focus faster. I’ll have to get a camera in my hands to confirm all of that. But I will say I’ve been really impressed with Sony camera image quality and performance over the past couple of years. They keep surprising me and doing things that I shouldn’t and couldn’t be done. So in spite of my skepticism, I have a good feeling about this camera. 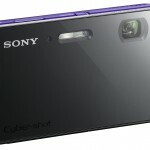 The Sony Cybershot TX200V will be available in March of 2012 in red, silver and violet finishes. The projected price is approximately $500. That’s a lot of dough so they must be pretty confident that the TX200V is going to be a performer.